Mycenae is a site located about 56 mi. [90 km. — “as the crow flies”] southwest of Athens in the Peloponnese. There is 9.5 mi. [15 km.] of plain to the south of it until one reaches the sea and it guards passes leading north from the plain into the mountains and on to the Corinth area and from there into mainland Greece. 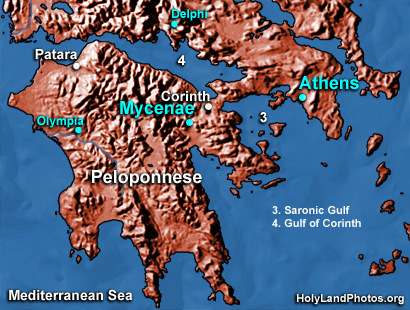 The high point of Mycenaean civilization was from 1600 to 1200 B.C. and because of its importance some of the pottery of this period is named “Mycenaean” and was used all over the Mediterranean world. Its rulers have also been immortalized in Homer’s works—the Iliad and the Odyssey.